The World’s murder capitals: Just a handful of countries account for most of the world's murders. 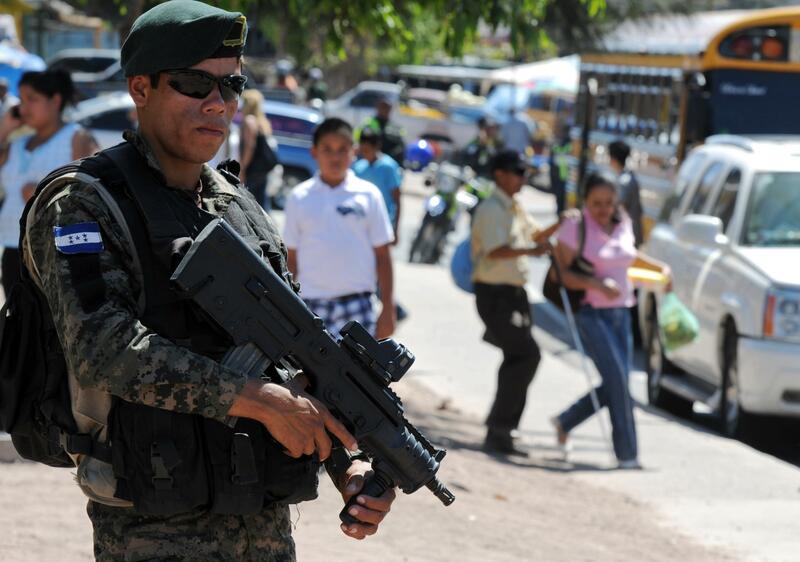 A soldier of the Honduran Army patrols the streets of Tegucigalpa on Feb. 9, 2013. The U.N. Office of Drugs and Crime released its 2013 Global Study on Homicide this week. Overall, the number of murders in the world is relatively stable—even declining slightly—but the most striking finding in the report is how geographically concentrated homicide is become. According to the report, a group of countries—all of them in either the Americas or Africa—accounting for just 11 percent of the global population are the location of 46 percent of the world’s homicides. Honduras has the world’s highest homicide rate at 90.4 murders per 100,000 people, and it’s not even close. Venezuela is next with 53.7. Belize, El Salvador, Guatemala, and Jamaica all have rates around 40. The Americas overtook Africa as the region with the world’s most murders in this year’s report, accounting for 40 percent of the world’s homicides, though that’s a somewhat misleading figure as there are wide geographical variations among and within countries in the region. The rates were driven largely by gang and drug violence. The Americas were also the only region where shooting accounted for the majority of homicides. The world’s safest country, in terms of homicide, is tiny Liechtenstein, which didn’t have any murders in 2012, but there are a number of countries, especially in Europe and East Asia, with rates lower than 1 per 100,000. Homicides are concentrated by gender as well. Men accounted for 95 percent of the perpetrators and 79 percent of the victims of homicide in 2012, a rate that is “consistent across countries and regions, irrespective of the homicide typology or weapon used.” Overall, one in seven homicide victims in 2012 were men between the ages of 15 and 29 living in the Americas. The one encouraging bit of news for Central America in the report was that a controversial truce negotiated in 2012 between El Salvador’s two largest gangs, the Mara Salvatrucha and Barrio 18, halved the country’s homicide rate, which had been the second-highest in the world. Unfortunately, this week brought news that the rate of killings has since increased again.